If you’ve had work done at All Seeing Eye Tattoo Lounge in Bradford, please sign our guestbook to let others know about your tattoo experience with us! Thanks!! Luke did a fantastic job of my grandsons name. Highly recommended. Cheers Luke for the tattoo of my grandsons name. Fantastic job, highly recommended. I had my first tattoo with Mav yesterday 9 August.2014 I would highly recommend these guys, very friendly and made me feel at ease. The banter helped a great deal to make me feel relaxed, well as relaxed as you can be when you are having a tattoo. Thank you also to the lad who let me go before him it was much appreciated and I hope you tattoo went well. WOW!! Just had a horrible tattoo covered by Mr.wade himself!!! WOW isn’t even enough!! Amazing friendly service and great advice!!! Absolutely stunned with the amazing cover up iv received!! Carnt wait to get another!!!!! Absolutely blown away with Steves work on my tattoo. Did a superb job of recreating my design, love it! Just to say thank you to Steve for my first tattoo! Nothing was too much trouble and I love the result !! Will defiantly Go back again !! Great day with Steve on Saturday – a bunch of us booked the day out and we’ve all walked away with tattoos we really love. It was my third visit and I can’t wait to go back and get more. The colours, shading and detail are unbeatable. Thanks for the great tattoo on Saturday. It was fun to hangout for the day getting tattooed with friends. I will be back soon. 3rd visit to all seeing eye and amazing work as ever! Steve really takes the time to draw up unique designs and make sure you are 100% happy. He’s also quick, EXTREMELY good (look at the galleries) and makes the whole experience as pleasant as possible. Absolutely LOVE my new tattoo! Steve gave me exactly what I wanted! Its beautiful! He helped me stay calm as I was quite nervous for my first tattoo! Also has great music taste ha! Will definitely be back for more! Following seeing how good my girlfriends piece that Steve and Zoe had done I was definite that I wanted Steve to do my first sleeve. Was nervous as this was my first tattoo and I only had ideas rather than a nailed down idea but Steve has been awesome! He’s helped to mould and shape those ideas into a sleeve (part way through) that is look amazing and that I love! My main thing was that I wanted big bright and beautiful colours and Steve’s colour work (that’s not to say his black and white work isn’t btw) is the best you’re gonna find out there! He’s really easy to be around and makes you feel comfortable and is open to questions about anything you might be nervous about or what to change up! Cannot say enough good things about this studio, get yourself inked here ASAP! Cheers Steve well impressed with the “extra” you put into the poppy on my Help For Heroes tattoo. Just need an idea for my next bit of work will deffo be back. Great tattooist, done 2 so far and another booked in, happy days! Funny guy, keeps you at ease, does fantastic work. Had one of steve’s cool designs done recently and turned out totally awsome. Really laid back feel and never even noticed my 4 broken fingers from grabbing the chair in pain ( total wuss i know ). Whatever! The tattoos are licked on by kittens.. Kinda. Steve just worked on a fantastic Hellboy piece for my arm. It looks incredible and I can’t recommend him enough! I reeeeally love my new tattoo and just as importantly I loved getting it done. The artist is really relaxed and welcoming, it felt like we were just hanging out only to come out with a sweet tattoo! I have already been stopped a few times at work and in bars by people to ask who the artist is which is awesome! I couldn’t be happier, it’s just what I wanted. Thanks so much! I’m again the proud owner of some of Steve’s tattoos. Told him my ideas, he came up with an incredible sketch and they look amazing. Thanks again dude. Absolutely awesome tattoo artist!! The tattoo studio itself is very welcoming and Steve makes you feel so at ease. I’ve currently only had one piece done by Steve but it’s incredible. My favourite tattoo to date. I’m booked in next week for my next. Would definitely recommend!! Nice bit of Boog on the calf, cheers Steve =) No doubt I’ll be back again for more at somepoint! I’ve had a couple of tatoos before so knew what to expect. Getting married a week. Prior to work being done. Gave Steve a design which I loved. He came up with his his own interpretation and I loved it even more. I work locally so was ideal but will defo use again if I choose to get more work done. My new wife is now also booked in and she takes some pleasing so can’t be bad! Cheers Steve. I turned up to Steve some what nervous to have my first tattoo’s , i was made to feel very welcome and at ease . The tattooing was more or less pain free i felt and i am very happy with the design . I am already planning my next trip and don’t think i would ever use any other tattooist now i know the professionalism of Steve . I went to Steve with lots of different ideas I wanted in my tattoo. The tattoo Steve desgin for me was amazing and far better then I ever imaged. Great guy and made me feel very comfortable while having the tattoo done. The shop is also very nice and very clean cant wait to go back again highly recommend thanks again. Absolutely made up with my new tattoo! Felt very comfortable with Steve. I’ll definitely be back! Thank you very very much!! If Your looking for a Artist to Make you Fall In Love With Your New Ink then Steve’s the man! Found the studio through a friend on Facebook and I was welcomed with the help and ideas of the design I wanted and fell in love with what was drawn up! If anyone is looking for a detailed , colourful and Time taken tattoo then I reccomend this studio! The artist is one of the best I’ve seen , and his passion and love for tattooing was shown in the tattoo I now have! Thanks again Steve! Will Deffo be back for more! Found Steve through a friend on Fb and ain’t I glad I did.. The man is a genius with the needles and his work is superb, he stops to listen to what u want and will design a one off piece just for you.. His attention to detail is relentless and will not put the gun down until completely satisfied its the work he wants the public to see!! I won’t go anywhere else now for my ink… Watch this space this guys gunna be huge.!! FACT!! Very friendly, great studio and very helpful with ideas for my tattoo. Steve was easy going and I was very relaxed during my tattoo, I’m very happy! Recently had a Russian Doll done by Steve and I absolutely love it!! Told Steve a vague idea of what I wanted and the design was even better than what I had imagined in my head (: looks great now that it is fully healed and I have had a lot of compliements on it. Steve was good company while having the tattoo done, was helpful as it took my mind off of the pain 😛 wish I had found out about his studio sooner! He draws some great designs and does amazing work! Thanks Steve will definitely be planning my next one soon! I had my second tattoo done by Steve before Christmas and just needed to come back here and say how awesome it looks all healed up! The colours in the bird are beautiful. Thanks again for a great tattooing experience! Steve tattooed Pink Floyd’s “The Division Bell” album cover onto my leg and it looks brilliant. I’m more than happy with the result and I was pleased that this little-known studio (for how long?) had such a welcoming host / artist. I have plans for a Floyd leg, but don’t tell the missus! I spent the day getting my feet tattooed last week by Steve and the whole experience was great! From the studio, to his creativity and personality. I am ecstatically happy with them, and they are healing very well. I have had loads of compliments already and I won’t hesitate in recomending Steve to others! (: thankyou!! I’m not new to the tattoo game by any stretch of the imagination (full sleeve on left arm, chest piece, upper and lower right arm work and 1 on my back!!) but this was my first visit to ASE. Steve is a confidant and competent artist doing some great original work. A nice friendly atmosphere but most importantly I came away with a fantastic piece if art. I would and will highly recommend Steve to friends. Thanks again for a great job well done. Fantastic afternoon session with Steve today. I asked him to do something that shouldn’t really work as a tattoo but he’s done it with all kinds of epic! Thanks again Steve, look forward to the next one! I’ll make it fun! If you have worries or concerns about getting a tattoo, don’t! This is a great studio; Steve was really creative with the design and listened to what I wanted as well as putting his own personal twist on it. He was really open about booking in a date to have it done and when I arrived, the studio looked great and Steve was really welcoming. I had my feet tattooed so I was a little concerned about how much it would hurt, but he was very reassuring and positive. The finished tattoos look amazing, I love them! Very Talented. I’ll defiantly be back for more; I can’t recommend this place enough! Thank you so much for my gorgeous Rose tattoo! Had fun between the pain! Well worth it will be letting everyone know about your studio, thanks again! I am chuffed to bits with my tattoo. I am already looking forward to returning to Steve for more fantastic work. Thanks fella! Very highly reccomended. From the outset steve was so helpful in helping me to make decisions about my tattoo all of which paid off. His work is amazing and i’m really pleased with how my tattoo turned out. I would definitely go back for more. A really nice guy who is really modest about his work and someone who i will recommend to others without a doubt. Just been tattooed at All Seeing Eye and cannot recommend it enough. From the outset Steve was lovely giving me guidance in my design ideas and drawing me an amazing tattoo. On the day he was incredibly meticulous over my tat and has done an amazing job! I love my piece of art and would definitely go back to Steve for more work and take friends there too. Thanks Steve, you’re a legend! 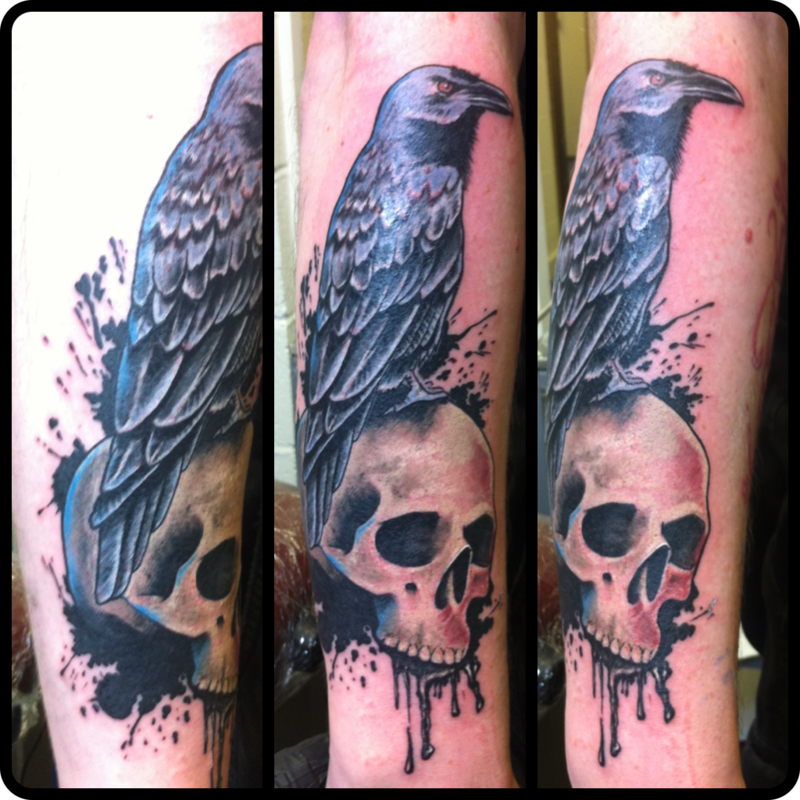 Steve did a fantastic custom design of a skull and a raven on my arm – he excelled himself it’s truly stunning. Cheers again mate! Many thanks to Steve on my new tattoo. Very helpful and great work. Really happy with the result. Steve worked on a day of the dead girl to cover an existing tattoo I had and his work is absolutely stunning. Could not be more happy, the guy is a legend. Once again Steve has worked his magic and I am beyond happy with my tattoo. The detail he has put in makes it really stand out and I can’t wait til it’s fully healed to see how truly stunning it actually is. Thanks again!! Cheers Steve for the 6 1/2 hours of pure fun, it turned out brilliant in the end. Thanks for everything from the sketch to the final tattoo. Just had my second tat from Steve and I couldn’t be more happy. I am already working out the rest so I can get my full sleve done. Cheers Steve soon as I am back from Norway I will be having some more ink. I gave Steve a very brief description of what I wanted and he has produced something that I could not be happier with. Absolutely love my tattoo, already planning the other leg now!! Steve puts you at ease, great artist and very welcoming atmosphere. I will be back for sure! Went for another session on my leg today and I can see my dragon piecing together nicely. Amazing colour work and some more line work done. The colour is looking sweet as a nut and again, I look forward to spending another session with Steve! Thanks once again mate! I really wanted a dragon designed and tattooed to the highest standard. I came across Steve and he’d designed me one better than what I had actually expected. The design covers almost my full leg. So far I have had the outline, shading and some colouring done and I ALWAYS look forward to going back to Steve for the relaxed, chilled out atmosphere. He is friendly, funny and always makes you feel right at home even in a studio. I will be going back for some more even when my dragon has been finished and I couldn’t ask to be inked by a better artist. Thanks Steve! Tattoo looks gorgeous, healing well, and loved the studio! Very friendly atmosphere, can’t wait to get another one done! Lovely little studio, really friendly tattooist. I found him really helpful with designing my tattoo and talking through the colours. I’d definitely recommend him to friends! Go get some ink!